Welcome! today we are celebrating the launch of the Artistic Effects CD. If this blog is your first stop, I encourage you to go to the beginning of the hop on the Design Team Blog (www.techniquejunkies.blogspot.com). You can follow the links from there to see all of the beautiful artwork celebrating this great new CD. If you have arrived here from Shelly Schmidt's blog, you are in the right place! I hope you have enjoyed what you have seen so far. The Artistic Effects CD contains 40 fun tutorials for using Gelatos, Gesso, Distress Stains, Goosebumps and irRESISTible Sprays. You will be able to use these great mediums in creative new ways -- and all of the techniques are easy. Of course, every one of the tutorials is in Step-by-Step Printable PDF format. The CD is $14.95 plus shipping. You can check it out HERE. Today I have two cards for you. The top card uses a technique called Gelatos Fingerpainting. This is such an easy technique and the colors pop off the paper! 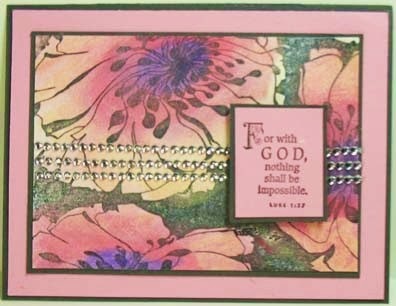 The saying is from a Technique Junkies Stamp Set: Proverbs; the base is a newly released stamp: Large Poppies. 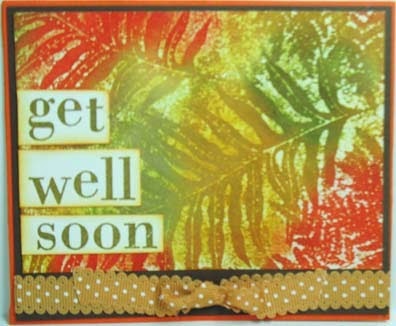 My second card uses the Goosed Stains Technique- it uses both Goosebumps and Distress Stains. LOVE LOVE LOVE this look! Again, all stamps are from Technique Junkies. I hope you enjoyed the hop - and I KNOW you will enjoy the CD! On a side note, the Technique Junkies site will be carrying Gelatos, Goosebmps, irRESISTible Sprays and Gesso, along with a few other products, starting on June 11th (or sooner). I apologize for the delay - my youngest son was recently diagnosed with Lymphoma and I have been spending a great deal of my time in the hospital with him.